I've been gone for over a month due to holidays, a head cold (once I got home), then a surprise visit from my brother who lives in another Province. But now the cold is gone and so is my brother, lol I'm finally back to work on new patterns. Yay me, I'm excited! I had most of this pattern done before I left on holidays so it didn't take me long to go through it. 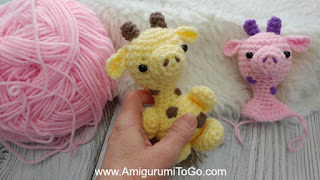 Tomorrow morning, around 10am Pacific Time, I will be releasing the first pattern in the Mini safari Friend series, the Giraffe. I have many videos that go along with my patterns, and there's many more to come. Click the button to go to my channel, have a look around. I hope you enjoy what you see! So cute. I love all your patterns.